Armenian-Turkish paper Agos, based in Istanbul reports. Maritza Kucuk in Istanbul's Samatya district. managed to escape and upon reaching the church applied to the police. responsible bodies are suspiciously silent. that about 20 police squads are working over the case. other crimes are not disclosed they will not be calm. Another elderly Armenian woman was assaulted, on Tuesday evening, in Istanbul’s densely-Armenian-populated Samatya district. The woman was attacked nearby a local police precinct. The assailant was around 35 years old and he was wearing black clothes. It is noted that the Armenian woman was severely beaten. As a result, her glasses were broken and its glass caused damage to the woman’s eye; she underwent a surgery on Wednesday morning. Istanbul Office of the Human Rights Association of Turkey called for a demonstration, on Wednesday at 4pm, against violence taking place on xenophobic grounds. To note, this is the third such attack against elderly Armenian women in Samatya. Edited by Zartonk, 23 January 2013 - 12:27 PM. Cowards are able to attack only elderly women, that says a lot. Long time ago lot of us like myself we saw danger living in Turkey and left , day and night I think that I made right decision. I wonder why this people still living in danger zone. ISTANBUL—Two elderly Armenian women were attacked in Istanbul’s Samatya district on Jan 22 and 23, less than a month after an 84-year-old Armenian woman was brutally murdered in Istanbul, raising the number of violent attacks against elderly Armenian women to at least four in recent months. The Jan. 22 attack happened around 5 p.m. when the victim, 83-year-old Sultan Aykar was about to enter her ground-floor apartment. She then saw an intruder, frightened, she fell. The attacker proceeded to kick her. Hearing her screams, neighbors came down, scaring off the masked man, reported Bianet. The neighbors described the attacker as a male between the ages of 35 and 40, with gray hair, and dressed in black. During the attack, Aykar suffered damage to her eye. She has now lost sight in that eye, despite surgery on Jan. 23. The victim’s daughter, Menzar Etik, said her mother did not have any enemies, as she was a quiet woman. Etik did not believe the attacker’s intention was robbery, as the attacker did not attempt to steal her purse, and there was nothing more than a broken TV in her apartment. Today (Jan. 23), another attack was reported on yet another elderly Armenian woman. This time the attack happened on the street, near the Samatya High School, sources reported. The two assailants ran away. The victim’s was covered with blood. Shortly thereafter, she disappeared. Community members and plainclothes policemen have been unable to find or identify the woman. The Armenian Weekly could not independently confirm the report on today’s attack. The Samatya area is home to many Armenians. The community is weary of these attacks, and there are calls for caution have been made. In recent years, there have been several attacks against Armenians in Turkey. In early December another Armenian woman was attacked and robbed; while months earlier an Armenian woman was attacked by a taxi driver and called an infidel. On Jan. 6, three assailants tried to kidnap an elderly Armenian woman, according to Turkish sources. The attempt failed. Hello dear Arshak, and welcome! What part of Turkey did you live in? Samatia district, the Radikal reported. organized group may be behind the assaults. other women add to our concerns," he said. an organized scheme. We will see to it that the cases are resolved,"
YEREVAN, JANUARY 25, ARMENPRESS: Vice President of Turkey's main opposition Republican People's Party Umut Oran has raised the issue of two cases of violence against elderly Armenian women in Turkish Parliament. Armenpress reports referring to “haberx.com” news agency. Already 5 Armenian elderly women have been attacked in Samatia district of Istanbul since December, 2012. One of them was tortured and killed in her house; a cross was carved on her body. Other two lost their eye in a result of severe attack. newspaper Agos in the article "Turkey is silent - attacks continue." assailant was dressed in black and was wearing a mask. 2 people were "following" the actions of the attacker. in the police, and then spoke at the press conference. they occur against the elderly, defenseless Armenians. incidents and take preventive measures. continuing violence against Armenians in the Samatya district. head and face, Akyar had her vision in the right eye deteriorated. This witness evidence proves that the assault was pre-arranged,"
assaults against the ethnic Armenians in the Istanbul district. to submit a report to the Interior Ministry in this connection. the attacks on ethnic Armenians in Istanbul's Samatya district. that police intensify its activity. violation,' the head of the organization Meral Cildir said. the attack on Sultan Aikar the local Greek church was stoned. 30, the other day 40,' one of them said. woman's light injuries, Turkish media say. least four in recent months, Asbarez reported. man, according to Bianet news agency. broken TV in her apartment. these attacks, and there are calls for caution have been made. driver and called an infidel. according to Turkish sources. The attempt failed. in these assaults is not credible, Radikal daily of Turkey reports. connecting links should be considered. Don’t touch my Armenian neighbor! ISTANBUL. 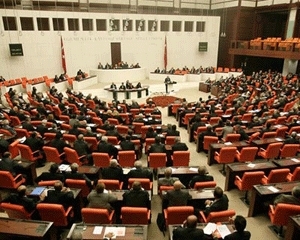 – The Democratic Peoples’ Congress of Turkey held a march Sunday to protest the recent attacks against Armenians, in Istanbul’s densely-Armenian-populated Samatya district, as a result of which an elderly Armenian woman was killed, two others lost one of their eyes, and an attempt was made to kidnap another. Past and present MPs as well as Khosrov Dink, the brother of Hrant Dink—the founder and chief editor of Istanbul’s Agos Armenian bilingual weekly, who was gunned down in 2007 in front of his office building—and many others took part in the event, Agos reports. During the march, the protesters held banners that read: “Don’t touch my Armenian neighbor!”, “Hatred is yours, humanity is ours”, and “We are with the Armenian people, we will not allow racism”. At the end of the march, MP Ertugrul Kurkcu spoke at Samatya Square and stressed that the aforesaid attacks against Armenians were carried out as a result of xenophobia. Also, he raised a suspicion that the police may be responsible for these attacks. The attacks on elderly Armenian women in Samatya were added by another one. They do not find any trace of the murder of Maritza Kucuk and attacks on elderly Armenian women continue, in the evening of January 22, at about 5p.m., 80-year-old Sultan Haykar was attacked. An Armenian woman was beaten at the time she was entering into the building. The assailant was dressed in black and was wearing a mask. The women’s screams were heard by the neighbors and they came to her help, the assailant escaped. Eyewitnesses claim that on the corner 2 people were “following” the actions of the attacker. Responses to the brutal murder on December 28, of Samata Maritza, who lived alone in Kucuk, are still ongoing. Before she was killed, she was also tortured. After the latest attack, members of the union rights movement in Turkey “Say no to racism and nationalism” and other public organizations visited the police of Aksaray, talked for an hour with the officials in the police, and then spoke at the press conference. Chairman of the Istanbul branch of the Union of Human Rights in Turkey Umit Efen said that they are concerned, as occuring one after another attacks are similar to specially organized and carried out actions on the ground of hate. He recalled the style of the attacks: they occur against the elderly, defenseless Armenians. Speaker of the “Say no to racism and nationalism” movement Cengiz Algan stressed his concern that the attacks on the Armenian women have been organized. He said that they have demanded a meeting with the governor of Istanbul Hussein Avni Mutlu to discuss the mentioned incidents and take preventive measures. meticulously planned within Turkey's state policy. Turkey (let alone Istanbul), accounting for not more than one third. or out of political necessity. Armenian woman was robbed and killed in early December 2012. Armenian woman but failed to do this. the throat three days prior to being found. widely known by the example of Hrant Dink's murderer's trial. people also leaving for Turkey will maintain their Armenian identity. Armenian women committed in recent months in Istanbul. current atmosphere in Turkey is much alike that in 1915.
nationalists and to gain additional political dividends. are in danger, said the Turkish studies expert. police will either demand bribes or will deport them to Armenia. Armenian citizens will certainly be the next victims," said Shakaryan. Armenpress reports citing Today's Zaman. with some of the words that this Armenian intellectual had made on TV.